Editor's note for Sept. 27, 2015: If you are looking for viewing details on the rare supermoon lunar eclipse of Sept. 27-28, 2015, please visit our complete coverage page: Supermoon Lunar Eclipse 2015: Full 'Blood Moon' Coverage . A total eclipse of the moon tonight is expected to delight skywatchers across the United States and much of the world. It will be the last total lunar eclipse until 2010. The easy-to-watch event will play out in several stages as Earth's shadow blocks sunlight from shining on the moon. Weather permitting, the eclipse will be visible from all locations in the United States, according to NASA. Along the Oregon and northern California coasts, the moon will rise during the early stages of the eclipse, however. Eclipses occur only at full moon when the sun, Earth and moon are in a perfect line. 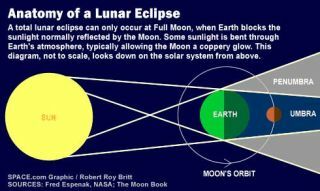 Because the moon's orbit around Earth is not perfectly aligned with the plane of Earth's orbit around the sun, eclipses do not occur at every full moon. The moon will enter Earth's umbral shadow (the full shadow) at 8:43 p.m. ET (that's 7:43 p.m. Central, 6:43 p.m. Mountain and 5:43 p.m. Pacific) on Wednesday, Feb. 20. It will appear as though an ever-larger bite is being taken out of the moon. Some 78 minutes later, the moon will slip into full eclipse. About 51 minutes later, a bright scallop will appear as the moon starts emerging. It will be completely out of the umbral shadow at 9:09 p.m. Pacific time, which is 12:09 a.m. ET on Thursday morning. For Europe and Africa, the eclipse is a predawn Thursday event, with the moon starting entry to the umbral shadow at 1:43 Greenwich (or Universal) Time. Look for the moon to possibly turn red during the total portion of the eclipse. "The exact color that the moon appears depends on the amount of dust and clouds in the atmosphere," according to a NASA statement. "If there are extra particles in the atmosphere, from say a recent volcanic eruption, the moon will appear a darker shade of red." The redness occurs because while the moon is in total shadow, some light from the sun passes through Earth's atmosphere and is bent toward the moon. The effect is to cast all the planet's sunrises and sunsets on the moon. Christopher Columbus famously used a blood-red eclipse in 1504 to frighten natives on Jamaica into feeding his crew. The planet Saturn and the bright star Regulus will form a broad triangle with the moon's ruddy disk, according to Joe Rao, SPACE.com's Skywatching Columnist. You don't need any special equipment to watch a lunar eclipse. Comfortable chairs and warm clothing are good ideas. A telescope will bring out interesting details of the lunar surface, and even a small telescope will reveal Saturn's stunning rings.